The Metiix Cloud Backup Solutions powered by AsigraTM requires no agents, which makes it easier to install and support than legacy backup and recovery solutions. Backup and recovery software typically requires agents that are installed onto the host servers that a system administrator wants to back up. Even in a modest-sized environment, agent management can get extremely complex when an administrator is forced to deal with different operating systems and revision levels. The complexity of agent management is further complicated by the growing number of software packages that also require agents running on the same host servers, or what is also referred to as “agent pollution." The Metiix Cloud Backup Service does not require any agents to be installed but instead reaches out over the network to back up operating systems, file systems, and applications, using industry standard programming interfaces. Agent-less architecture saves you time. Dealing with backup software agents is a cumbersome and mundane task that can be extremely time-consuming. Matching agent revisions with operating system levels, researching compatibility issues, and other labor-intensive tasks are nonexistent when using the Metiix Online Cloud Storage. Agent-less architecture is easier to support. Additionally, many problems that occur while managing backup software are due to agent bugs and their incompatibility with host servers. Metiix Cloud Backup Services are inherently easier to support and the risk of problems is reduced as compared with other solutions because of its agent-less design. Agent-less architecture is less resource-intensive. Traditional backup and recovery software puts agents onto servers and processing power is being stolen away from a server’s core application to feed the needs of agents. 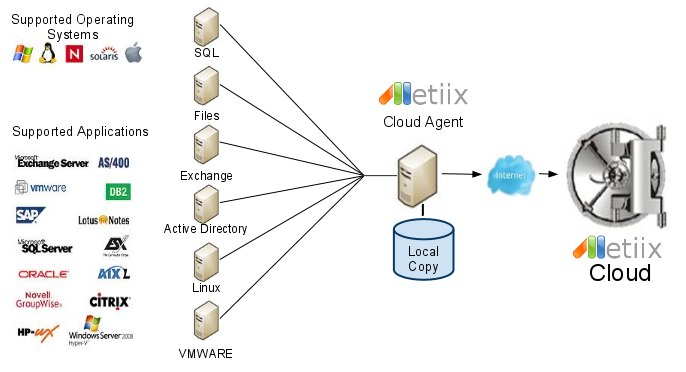 The Metiix cloud Service makes no such demands of the servers it is backing up.